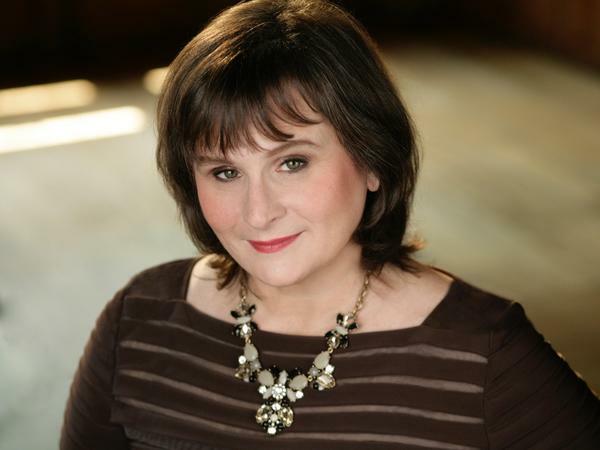 Kim Witman has been working with Opera and Classical Programming at Wolf Trap Opera in Vienna, Virginia since 1985. 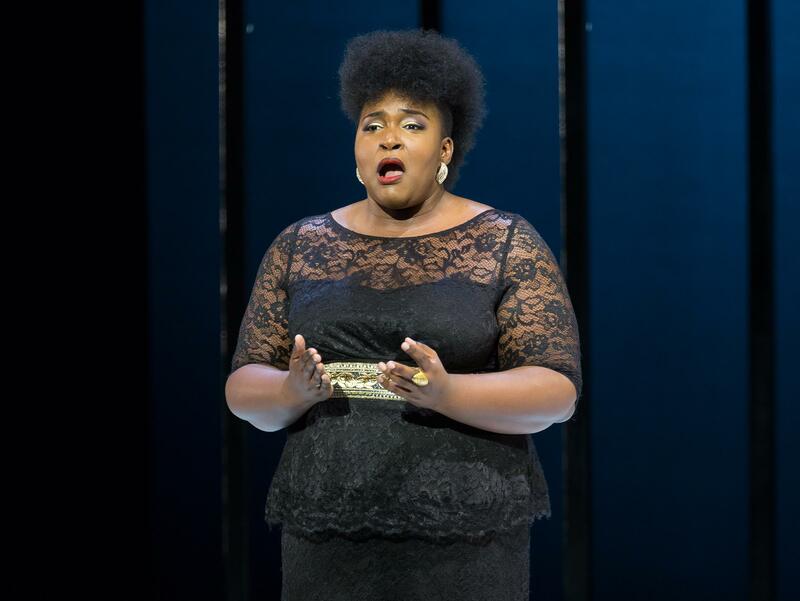 Soprano Leah Hawkins performs in Justice at the Opera. The #MeToo movement has been a cultural reckoning across industries, from Hollywood to restaurants — but one of the oldest that's been affected is classical music. In March, James Levine, a longtime conductor of the Metropolitan Opera in New York City, was fired for allegations of sexual misconduct. And now, centuries-old works from Carmen to Don Giovanni are being challenged for misogynistic plots and themes. 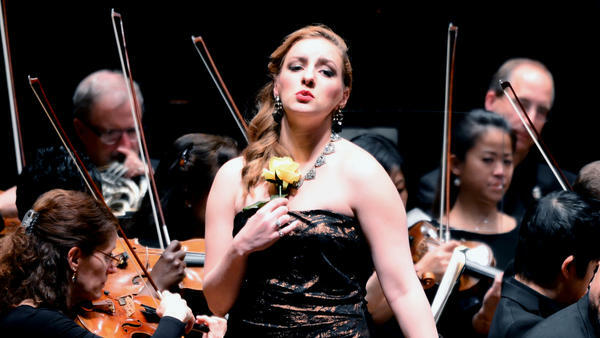 NPR's Lulu Garcia-Navarro spoke with three women — opera singers Leah Hawkins and Aleks Romano, as well as Kim Witman, vice president of opera and classical programming at Wolf Trap Opera in Virginia — about their experiences and reaction to the #MeToo movement in the opera world. Hear the full conversation at the audio link and read an edited transcript below. Lulu Garcia-Navarro: I want to start with your personal reactions to the movement. 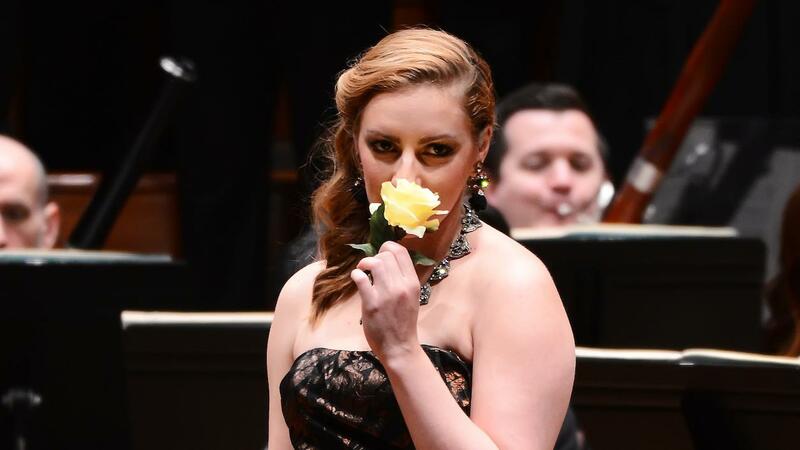 Where is it at in the opera world? What has surprised you and impressed you? Are these conversations that you're having amongst yourselves? Aleks Romano: I think for a lot of us it's underscored individual thoughts that we've had internally or privately in a rehearsal room. It's really made us more aware of some of the shortcomings of our art form and how we can adjust our perspective as role models. Leah Hawkins: I would agree that people are more aware and people are asking questions and checking comfort levels. And I feel that it's been that way for me my entire career, even though I'm in the beginning of it. Kim Witman: Also, it's been accompanied by an increased focus on gender parity and diversity. I think it's all leading to a much healthier environment in our industry and everywhere else. Garcia-Navarro: I have friends who are opera singers and I saw really interesting Facebook threads when the whole #MeToo movement blew up — about their own personal experiences and how difficult it had been when they were starting out. They're a bit older and a lot of these discussions were long overdue in this world, because even though, obviously, female artists are very important to the genre, it is often men who still preside over these spaces. Is that something you have felt? Romano: I think that it's really come down to a power discussion in opera. That was the discussion I found most interesting on social media: It came down to who was in the position of power and who was sort of subservient. Witman: I think one of the things that makes us unique is that we are embedded with a centuries-old Western European tradition that was led by men, and it formed our industry — the classical music industry and opera in particular — maybe a bit more aggressively than others. So I think this conversation is very much needed. Garcia-Navarro: It's interesting that you bring that up: Earlier this year, an Italian production of Carmen changed the ending so that the title character kills her admirer and abuser, Don José, rather than being killed herself. How do you produce and handle the themes of these works that are mostly written and composed by, as you say, white men? Witman: It's my favorite question to answer! Thank you very much for that [laughs]. I think there are a number of different ways you can go with these things. One is that you can produce them what we call traditionally, and then develop a series of conversations around the fact that these are cautionary tales from our history. And of course, the other extreme is to take the actual vehicle itself and change it in some way. This was a very aggressive way of doing that by changing the ending, but there are other less aggressive ways of pointing out allegories and things like that. So it's fascinating to see things happening along that whole spectrum. Garcia-Navarro: Aleks, you have performed Carmen at the Kennedy Center in Washington, D.C.
Romano: It's a role that I hope to continue to encounter over and over again. Garcia-Navarro: It's one of the great roles. Romano: Especially for mezzos! We don't get a lot of leading ladies, so we've really got to make it count. But the greatest thing about Carmen is that it does open this conversation for how we treat gender, and what feminism looks like onstage in the world, and who really has the power in that piece. You know, I think we typically come to Carmen as a sort of feminist manifesto of opera, and I'm not always convinced that that's the case. She has to fight tooth and nail for every minute that she has "power." And she still gets stabbed at the end by the man that she basically just said "I don't want to date you anymore" to. So it always is a conversation with the director, with the conductor, with my castmates. And I'm very glad that opera is such a collaborative art form with so many open minded people in it. Garcia-Navarro: When you have these conversations with men, what is that like? Are they thinking about these things in the same way as you are? Hawkins: Certainly men in my generation are, but when you have conversations with older men, they don't always understand. They sort of make fun of the movement and say, "Oh, I'm sorry, am I allowed to say that to you?" So you're fighting with those kinds of attitudes. But I would say my colleagues are absolutely open to it, and I'm actually very inspired by their understanding and wanting to make us comfortable. Garcia-Navarro: Part of the thing that any performance-based career has is the message that, "Hey, there are a million people who would love to be where you are, so count yourself lucky. You should just accept whatever comes your way, because there are a lot of other people who'll do whatever it takes to get where you are." Romano: I'll tell you, this whole experience being part of a production of Carmen and being able to have these conversations is equal parts empowering and absolutely terrifying. Will I ever sing in another production of Carmen again if people know that I take issue with the fact that she is abused and murdered? It's a huge risk to speak your mind as an artist in some ways. But I also think that it's being bolstered and people really care to know my thoughts about the character, speaking from my own personal experience. Garcia-Navarro: I'm going to ask you because you are, Kim, a woman in power, a woman in authority: Where do you see your role in this? Witman: My role in this — and thank you very much, power and authority are not two things that I think of — but my role ... is to keep the conversations going and keep them public. And I think I'm also responsible for helping to identify women to put, as we say, in the pipeline: to make sure that if I see someone whose work deserves to have a light shone on it, that I can participate in doing that. Garcia-Navarro: I'm going to give the last word to you, Leah. Hawkins: I take comfort in knowing that, yes, I'm very lucky to be in the position I'm in, but also I work really hard. So I feel like my voice should be heard, and my opinion should be valued. And I feel very lucky in this position that I'm in at the time that I'm entering the business. I'm allowed, in many ways, to do that because of women who came before me and because of the conversations that were had and are being had. Harvey Weinstein's arraignment in New York this past week was the beginning of accountability for men in Hollywood. That industry was the catalyst for the #MeToo movement. But one of the oldest industries that's been affected by #MeToo is opera. In March, James Levine, a longtime conductor of the Metropolitan Opera in New York City, was fired for allegations of sexual misconduct. And works from "Carmen" to "Don Giovanni" are being challenged for the role that women play. We're joined now by three women in the opera world. Leah Hawkins and Aleks Romano are opera singers. And Kim Witman is vice president of opera and classical programming at Wolf Trap Opera in Virginia. HAWKINS: Great to be here. GARCIA-NAVARRO: I just want to start with your personal reactions to the movement. Where is it at in the opera world? What has surprised you and impressed you? And are these conversations that you're having amongst yourselves? ROMANO: ...Yes, individual thoughts that we've had internally or privately in a rehearsal room. And it's really made us more aware of some of maybe the shortcomings of our art form and how we can adjust our perspective as role models. HAWKINS: I would agree that people are more aware, and people are asking questions and checking comfort levels. And I feel that it's been that way for me my entire career, even though I'm in the beginning of it. WITMAN: Also, it's been accompanied by an increased focus on gender parity and diversity. And I think it's all leading to a much healthier environment in our industry and everywhere else. GARCIA-NAVARRO: Yeah, I have friends who are opera singers. And I saw really interesting Facebook threads when the whole #MeToo movement blew up about their own personal experiences and how difficult it had been when they were starting out. They're a bit older. And a lot of these discussions were long overdue in this world because even though, obviously, female artists are very important to the genre, it is men often who, as in many places still, sort of preside over these spaces. Is that something that you have felt? ROMANO: I think that it's really come down to a power discussion in opera. And that was the discussion that I found most interesting on social media feeds - is that it came down to who was in the position of power and who was sort of subservient. WITMAN: I think one of the things that makes us unique is that we are embedded with a centuries-old Western European tradition that was led by men. And it formed our industry called the classical music industry and opera, in particular, I think maybe a bit more aggressively than others. So I think this conversation is very much needed. GARCIA-NAVARRO: Kim, it's interesting that you bring that up. Earlier this year, an Italian production of "Carmen" changed the ending where she shoots her admirer and abuser Don Jose. How do you produce and handle the themes of these works that are mostly written and composed by, as you say, white men? WITMAN: It's my favorite question to answer. WITMAN: Thank you very much for that. GARCIA-NAVARRO: I'm glad I asked it. WITMAN: I think there are a number of different ways you can go with these things. One is that you can produce them what we call traditionally and then develop a series of conversations around the fact that these are cautionary tales from our history. And, of course, the other extreme is to take the actual vehicle itself and change it in some way. This was a very aggressive way of doing that by changing the ending. But there are other less aggressive ways of pointing out allegories and things like that. So it's fascinating to see things happening along that whole spectrum. GARCIA-NAVARRO: Aleks, you have performed "Carmen," actually, at the Kennedy Center in Washington, D.C. How did you approach that role that was different? GARCIA-NAVARRO: It's one of the great roles (laughter). ROMANO: It's one of the great roles, especially for mezzos. You now, we don't get a lot of leading ladies. ROMANO: So you really got to make it count. But the greatest thing about "Carmen" is that it does open this conversation for how we treat gender. And what does feminism look like on stage and in the world? And who really has the power in that piece? You know, I think we typically come to "Carmen" as this sort of, like, feminist manifesto of opera. And I'm not always convinced that that's the case. She has to fight tooth and nail for every minute that she has, quote, unquote, "power." And she still gets stabbed at the end by the man that she basically just said, I don't want to date you anymore to. So it always is a conversation with the director, with the conductor, with my cast mates. And I'm very glad that opera is such a collaborative art form with so many open-minded people in it. GARCIA-NAVARRO: And I'm curious - when you have these conversations with men, what is that like? I mean, are they thinking about these things in the same way as you are? HAWKINS: Certainly, men in my generation are. But when you have conversations with older men, they don't always understand. And they sort of - they make fun of the movement. And say, oh, I'm sorry. Am I allowed to say that to you? #MeToo? So you're fighting with those kinds of attitudes. But I would say, like, my colleagues are absolutely open to it. And I'm actually very inspired by their understanding and wanting to be - wanting to make us comfortable. ROMANO: I mean, I'll tell you. Like, this whole experience being part of a production of "Carmen" and being able to have these conversations is equal parts empowering and absolutely terrifying. Will I ever sing another production of "Carmen" again if people know that I take issue with the fact that she's abused and murdered? It's a huge risk to speak your mind as an artist in some ways. But I also think that it's being bolstered. And people really care to know my thoughts about the character, just speaking from my own personal experience. GARCIA-NAVARRO: I'm going to ask you because you are, Kim, a woman in power, a woman in authority. Where do you see your role in this? WITMAN: My role in this - and thank you very much. I - power and authority are not two things that I think of. But my role at this is to - I feel as if I said this too many times - but is to keep the conversations going and keep them public. And I think I'm also responsible for helping to identify women to put, as we say, in the pipeline, to make sure that if I see someone whose work deserves to have a light shone on it, that I can participate in doing that. GARCIA-NAVARRO: And I'm going to give the last word to you. HAWKINS: I take comfort in knowing that, yes, I'm very lucky to be in the position I'm in. But also, I work really hard. So I feel like my voice should be heard, in my opinion should be valued. And I feel very lucky in this position that I'm in and at the time that I'm entering the business that I'm allowed in many ways to do that because of women who came before me and because of the conversations that were had and are being had. GARCIA-NAVARRO: Leah Hawkins, Kim Witman, Aleks Romano, thank you all very much for joining me. WITMAN: Thank you so much. ROMANO: Thank you so much. (SOUNDBITE OF ORCHESTRA OF THE STATE HERMITAGE, TBILISI SYMPHONY ORCHESTRA ET. AL'S "CARMEN, SUITE, NO.2 NOCTURNE") Transcript provided by NPR, Copyright NPR.